Each year since 1984, the West Virginia Behavioral Risk Factor Survey has measured a range of risk factors that can affect our health. This report presents state survey results for the year 2006 and county data combined for 2002 through 2006. The survey is conducted by telephone and represents a collaborative effort between the West Virginia Bureau for Public Health (WVBPH) and the Centers for Disease Control and Prevention (CDC) in Atlanta. Standardized survey methods are provided by CDC. All 50 states, the District of Columbia, and several U.S. territories now participate in the system, known as the Behavioral Risk Factor Surveillance System (BRFSS). The information in this document serves as a resource for governments, business leaders, schools, and community groups, all of which are helping to shape the health of West Virginia. West Virginia ranked 2nd highest nationally in 2006 in reporting the general health of adults as either "fair" or "poor." More than one-fifth of West Virginia adults (22.5% in 2006) considered their health to be either "fair" or "poor." "Fair" or "poor" health was most common among groups of adults who are the oldest, least educated, or lowest in household incomes. Almost one-fifth of West Virginia adults age 18 to 64 had no health care coverage (18.9% in 2006). Among adults of all ages, slightly under one-fifth needed medical care within the past 12 months and could not afford it (17.2% in 2006). One-fifth of all age adults also did not have a specific personal doctor or health care provider (20.3% in 2006). Approximately one-fourth of state adults (25.6% in 2006) did not participate in any leisure-time physical activity for exercise. A general downward trend occurred between 1994 and 2006. Women were significantly more likely than men to be physically inactive during leisure time. West Virginia ranked highest nationally in 2006 for the prevalence of diabetes. More than one in ten of the state's adults identified themselves as having diabetes (12.1% in 2006). Among diabetic adults, 13.9% did not have an HbA1c test, 33.6% did not have a dilated eye exam, and 29.0% did not have a professional foot exam in the past one year. About one-third (33.5% in 2006) of diabetic adults checked their blood glucose at home less than once daily or never. The obese proportion of the adult population was 31.0% in 2006, 2nd highest nationally. Between 1993 and 2006, a substantial increase in obesity occurred among West Virginia adults. Men and women from a wide range of age, education, and income categories contributed to this unhealthy trend. During 2006, two-thirds of West Virginia adults were either obese or overweight. Current cigarette smoking: More than one-fourth of adults (25.7% in 2006) smoked every day or some days. West Virginia ranked 2nd highest in 2006 in the prevalence of this risk factor among 51 national BRFSS participants (US States and DC). About half (49.3% in 2006) of every day smokers tried to quit and succeeded for at least one day in the past year. Most adults employed indoors reported that smoking is prohibited in either work areas, public areas, or both within their workplaces. A majority of West Virginia adults did not allow cigarette smoking inside their homes (65.3% in 2006). In 2006, 11.9% of adults had ever been diagnosed with asthma (39th highest nationally) while 8.6% had asthma currently (22nd highest nationally). Women had significantly higher rates of both lifetime and current asthma than men in 2006. West Virginia alcohol consumption remains notably low in comparison with levels consumed elsewhere in the U.S. Binge drinking was 11.1% among adults in 2006 (a national rank of 46th). Heavy drinking among adults was a lower 3.2% in 2006 (a national rank of 49th). West Virginia ranked higher than any other state in 2006 in the prevalence of heart attack among adults. More than seven percent (7.5%) of the state's adults had a history of heart attack, compared with a national average of 4.4%. Men reported a significantly higher incidence of heart attack than women (9.2% vs. 5.9% in 2006). In the prevalence of stroke among adults, West Virginia ranked 2nd highest nationally in 2006. Four percent (4.2%) of the state's adults had had a stroke, compared with a national average of 2.7%. Table I below shows selected risk factor rates and the corresponding numbers of West Virginians who are estimated to be at risk. Data are shown for the latest available year. a. The percentages and numbers of persons estimated to be at risk are subject to sampling error. Please refer to the confidence intervals presented in the chapters of this report for a more complete perspective. In addition, the risk estimates were derived from population estimates available at the end of the data collection period. Later estimates of the same population may result in different estimated numbers of persons at risk. A risk factor is a health-related behavior or practice that has been shown to increase the probability of developing a condition or disease. This report presents West Virginia prevalences for selected risk factors. Prevalence is the percentage of the population having a particular condition or characteristic or practicing a certain health-related behavior. 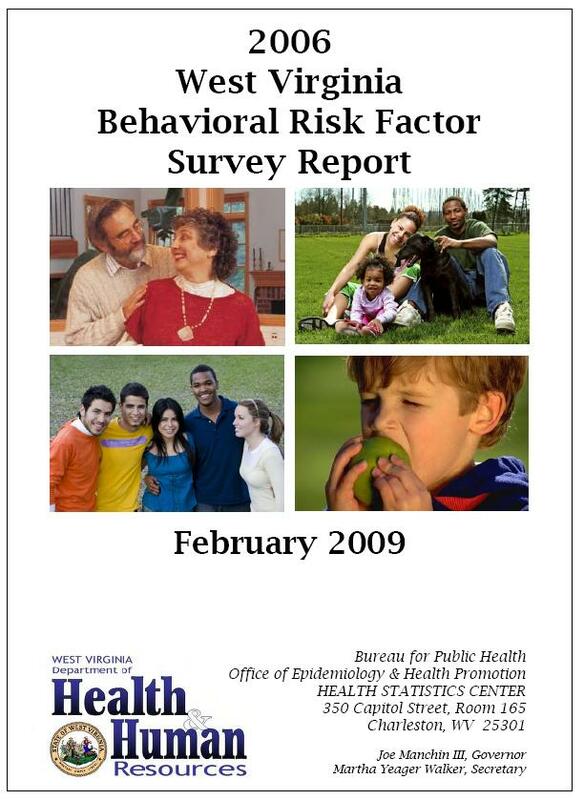 This report presents the results of the Behavioral Risk Factor Surveillance Survey (BRFSS) in West Virginia as a series of "prevalence" estimates for selected risk factors. Prevalence is also referred to as rate or frequency. Confidence intervals (CIs) reflect sampling error. They are presented as upper and lower boundary values surrounding the prevalence estimate; the true value of the estimate can be expected to fall within this range with a confidence of 95%. Significant is the term used to describe prevalence estimates that have been tested and found to be statistically different. In this report, a difference is said to be significant when the 95% confidence intervals (CIs) associated with each of the prevalence estimates do not overlap. In other words, it can be stated with 95% certainty that the difference found between the two prevalence estimates is not a random occurrence. Identifying differences as "significant" can detect changes in prevalence over time and direct attention to characteristics associated with a particular health condition or risk behavior. In this report, adjectives such as slight, minor, and little may be used to describe less reliable differences, those for which the confidence intervals do overlap. See Methodology for additional discussion. Sections are in PDF format and require the Adobe Reader for viewing. This report was posted to the WEB in March 17, 2009. 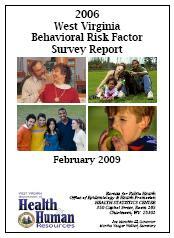 For information about the WV Behavioral Risk Factor Survey, email Paul.F.King@wv.gov.